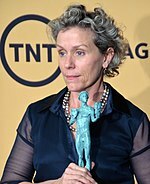 Three Billboards Outside Ebbing, Missouri won the most awards for the evening with four, including Best Motion Picture – Drama. The Shape of Water and Lady Bird won two awards each. Big Little Lies, The Handmaid's Tale, and The Marvelous Mrs. Maisel were among the television shows that received multiple awards. Ansel Elgort – Baby Driver as Miles "Baby"
During a pre-show event the award for "Best Podcast" was announced. The event was streamed live on YouTube. In support of the #MeToo and Time's Up movements, practically all the attendees wore black. Many of the acceptance speeches specifically mentioned these causes, including that of Oprah Winfrey. Previously known as Miss or Mr. Golden Globe, the title was changed this ceremony to Golden Globe Ambassador to better reflect inclusiveness. The inaugural ambassador was Simone Garcia Johnson, daughter of Dwayne Johnson and Dany Garcia. Due to the Weinstein effect, many attendees wore black in support of the Time's Up movement, and wore corresponding #MeToo pins. Tarana Burke, who created the "Me too" movement in 2006, attended the awards as a guest of Michelle Williams. Activists attended the ceremony as guests, namely: Tarana Burke as a guest of Michelle Williams, Rosa Clemente as a guest of Susan Sarandon, Saru Jayaraman as a guest of Amy Poehler, Billie Jean King as a guest of Emma Stone, Marai Larasi as a guest of Emma Watson, Calina Lawrence as a guest of Shailene Woodley, Ai-jen Poo as a guest of Meryl Streep, and Mónica Ramírez as a guest of Laura Dern. The ceremony averaged a Nielsen 5.0 ratings/18 share, and was watched by 19.0 million viewers. The ratings was a five percent decline from the previous ceremony's viewership of 20.02 million, becoming the lowest since 2012. ^ "75th Annual Golden Globe Awards". Retrieved November 23, 2017. ^ Hill, Libby. "Seth Meyers to host the 2018 Golden Globes". LA Times. Retrieved December 9, 2017. ^ "Seth Meyers to Host 2018 Golden Globe Awards". The Hollywood Reporter. Retrieved December 9, 2017. ^ "Oprah Winfrey: Recipient Of The Cecil B. deMille Award 2018". 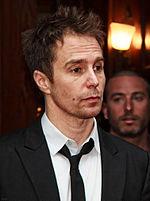 www.goldenglobes.com. Retrieved December 14, 2017. ^ "Oprah to get top Golden Globe honour". BBC News. December 14, 2017. Retrieved December 14, 2017. ^ a b "Golden Globes: Full list of nominees". BBC News. Retrieved December 11, 2017. ^ "Three Billboards wins big at Golden Globes and #MeToo movement makes its mark – as it happened". Guardian. January 7, 2018. Retrieved January 8, 2018. ^ "Guillermo del Toro wins the 2018 Golden Globe for Best Director". The Verge. Retrieved January 8, 2018. 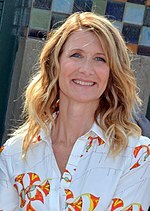 ^ "Golden Globes 2018: 'Lady Bird,' 'Big Little Lies' Win Big". Rolling Stone. Retrieved January 8, 2018. ^ Heritage, Stuart (January 8, 2018). "Golden Globes 2018: Why The Handmaid's Tale and Big Little Lies had to win". The Guardian. ISSN 0261-3077. Retrieved January 8, 2018. 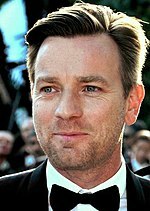 ^ "The full list of nominations for the Golden Globes 2018". Guardian. December 11, 2017. Retrieved December 12, 2017. ^ Barnes, Brooks (December 11, 2017). "'The Shape of Water' and 'Big Little Lies' Lead Golden Globe Nominations". The New York Times. Retrieved January 10, 2018. ^ Respers, Lisa (December 12, 2017). "'Shape of Water,' 'Big Little Lies' lead Golden Globe nominations". CNN Entertainment. Retrieved January 10, 2018. ^ "The Post Team Thrilled Over Six Golden Globe Nominations". News 18. Indo Asian News Service. December 12, 2017. Retrieved January 10, 2018. ^ "Spielberg, Streep and Hanks react to the six Golden Globes nominations for 'The Post'". Los Angeles Times. December 11, 2017. Retrieved January 10, 2018. ^ Express Web Desk (January 6, 2018). "Golden Globes 2018: Why Three Billboards Outside Ebbing, Missouri could win Best Motion Picture (Drama)". The Indian Express. Retrieved January 10, 2018. ^ Jang, Meena (January 7, 2018). "Golden Globes: 'Three Billboards Outside Ebbing, Missouri' Wins Best Motion Picture, Drama". The Hollywood Reporter. Retrieved January 10, 2018. ^ Yahr, Emily (January 8, 2018). "'Three Billboards Outside Ebbing, Missouri' wins best motion picture, drama". Washington Post. Retrieved January 10, 2018. ^ Kaufman, Amy (December 11, 2017). "Greta Gerwig on 'Lady Bird's' four nominations, and her absence in the Golden Globes' director category". Los Angeles Times. Retrieved January 10, 2018. ^ Lopez, Ricardo (January 7, 2018). "'Lady Bird' Wins Best Picture Comedy, Giving Greta Gerwig Her Moment in the Spotlight". Variety. Retrieved January 10, 2018. ^ Egel, Benjy (December 11, 2017). "'Lady Bird' nominated for four Golden Globe awards". Sacbee. Retrieved January 10, 2018. ^ Tapley, Christopher (December 11, 2017). "Golden Globes: 'All the Money in the World' Lands Three Nominations After Whirlwind Reshoots". Variety. Retrieved January 10, 2018. ^ Zeitchik, Steven (December 11, 2017). "The Golden Globes just rewarded a film that made a startling move to emerge from a sexual harassment cloud". Washington Post. Retrieved January 10, 2018. ^ Kaufman, Amy (December 11, 2017). "'All the Money in the World' Golden Globe nominations preview how awards season responds to sexual misconduct". Los Angeles Times. Retrieved January 10, 2018. ^ Sharf, Zack (December 11, 2017). "'All The Money in the World': Christopher Plummer Earns Golden Globe Nomination After Replacing Kevin Spacey". Indie Wire. Retrieved January 10, 2018. ^ Montgomery, Daniel (January 3, 2018). "Golden Globes 2018: Will 'Call Me by Your Name' be the latest LGBT winner for Best Film?". Gold Derby. Retrieved January 10, 2018. ^ Cullum, Erin (January 9, 2018). "15 People Who Were Heartbroken by Call Me by Your Name's Golden Globes Snubs". PopSugar. Retrieved January 10, 2018. ^ Megarry, Daniel (January 8, 2018). "Call Me By Your Name was snubbed at the Golden Globes last night". Gay Times. Retrieved January 10, 2018. ^ Montgomery, Daniel (January 2, 2018). "2018 Golden Globe predictions: Why 'Dunkirk' can still win Best Film Drama with only 3 nominations". Gold Derby. Retrieved January 10, 2018. ^ "'The Greatest Showman'". Los Angeles Times. Retrieved January 10, 2018. ^ Dixon, James Marcus (January 2, 2018). "Allison Janney ('I, Tonya') has 7 Emmys but 0 Golden Globes: How is that even possible?". Gold Derby. Retrieved January 10, 2018. ^ D'Alessandro, Anthony (December 11, 2017). "Margot Robbie On What Projects Are Next & How 'I, Tonya' Speaks To Today's World – Golden Globes Reaction". Deadline. Retrieved January 10, 2018. ^ "2018 Golden Globe Nominations: See the Full List". Vanity Fair. December 11, 2017. Retrieved January 10, 2018. ^ Chow, Andrew R. (December 11, 2017). "2018 Golden Globe Nominations: Full List". The New York Times. Retrieved January 10, 2018. ^ Rottenberg, Josh (January 7, 2018). "'Three Billboards' and 'Big Little Lies' are the top winners of a very different kind of Golden Globes awards". Los Angeles Times. Retrieved January 10, 2018. ^ Blistein, Jon (January 8, 2018). "Golden Globes 2018: 'Lady Bird,' 'Big Little Lies,' 'Three Billboards' Win Big". Rolling Stone. Retrieved January 10, 2018. ^ "Guillermo del Toro gana a Mejor Director en los Globos de Oro". Milenio (in Spanish). Mexico. January 7, 2018. Retrieved January 10, 2018. ^ Redacción (January 8, 2018). "Guillermo del Toro se eleva en Globo". El Universal (in Spanish). Mexico. Retrieved January 10, 2018. ^ THR Staff (January 8, 2018). "Alexander Skarsgård Accepts Award for 'Big Little Lies' | Golden Globes 2018". The Hollywood Reporter. Retrieved January 8, 2018. ^ Yahr, Emily (December 11, 2017). "'Big Little Lies' dominates Golden Globes nominations, just as HBO renews it for Season 2". Washington Post. Retrieved January 10, 2018. ^ Merry, Stephanie; Yahr, Emily (December 11, 2017). "Golden Globes nominations 2018: Complete list of nominees". The Washington Post. Retrieved January 10, 2018. ^ Littleton, Cynthia (January 7, 2018). "'Big Little Lies' Team Says Female-Focused Stories Are 'Good Business'". Variety. Retrieved January 10, 2018. ^ Lang, Brent (January 7, 2018). "Golden Globes 2018: 'Three Billboards,' 'Big Little Lies' Dominate Politically Charged Show". Variety. Retrieved January 10, 2018. ^ Lynch, Jason (January 8, 2017). "The Handmaid's Tale Wins Big Again During the Most Political Golden Globes Telecast Ever". Adweek. Retrieved January 10, 2018. ^ Plaugic, Lizzie (January 7, 2018). "Amazon's The Marvelous Mrs. Maisel wins the 2018 Golden Globe for best TV comedy". The Verge. Retrieved January 10, 2018. ^ Menetz, David (January 7, 2018). "Golden Globes: The Mrs. Maisel Team Reacts to Winning an Award for Once". TV Line. Retrieved January 10, 2018. ^ "The Golden Globes proved awards shows can be relevant in the era of #MeToo". Vox. Retrieved January 8, 2018. ^ "#MeToo, powerful speeches dominate the 75th Golden Globe Awards". NBC News. Retrieved January 8, 2018. ^ a b Russian, Ale (December 28, 2017). "Gal Gadot, Halle Berry, Emma Watson and More Announced as Presenters at 2018 Golden Globes". People. Retrieved January 1, 2018. ^ a b c d e f Boucher, Ashley (January 5, 2018). "Golden Globes 2018: Roseanne Barr, John Goodman to Present (Exclusive)". SFGate. Retrieved January 4, 2018. ^ a b c Guglielmi, Jodi (January 5, 2018). "Golden Globes: Kate Hudson, Zac Efron and Robert Pattinson Added to List of Presenters". People. Retrieved January 5, 2018. ^ a b Johnson, Zach (January 4, 2018). "Jennifer Aniston and Angelina Jolie at Golden Globes 2018 as presenters". E! Online. Retrieved January 4, 2018. ^ a b "Halle Berry, Carol Burnett among Golden Globe presenters". The Washington Post. Associated Press. December 28, 2017. Retrieved January 2, 2018. ^ a b c Gans, Andrew (December 28, 2017). "Darren Criss, Carol Burnett, Neil Patrick Harris, More Among 2018 Golden Globe Presenters". Playbill. Retrieved January 2, 2018. ^ a b c d e f "'Thelma & Louise' return! Davis, Sarandon reunite at Globes". APNews. January 5, 2018. Retrieved January 5, 2018. ^ a b c d e f g h i Drysdale, Jennifer (January 2, 2018). "2018 Golden Globes Presenters: Angelina Jolie, Jennifer Aniston and More". ET. Retrieved January 5, 2018. ^ Drysdale, Jennifer (December 28, 2017). "Emma Watson and Christina Hendricks to Present at 2018 Golden Globes". ET Online. Retrieved January 2, 2018. ^ ET Online (December 28, 2017). "Emma Watson and Christina Hendricks to Present at 2018 Golden Globes". Yahoo! Entertainment. Retrieved January 2, 2018. ^ a b c Aniftos, Rania (January 5, 2018). "Mariah Carey, Keith Urban & Common to Present at Golden Globes: Exclusive". Billboard. Retrieved January 4, 2018. ^ Butler, Karen (December 29, 2017). "Kelly Clarkson Confirmed as Golden Globe Awards Presenter". PopCrush. Retrieved January 2, 2018. ^ Rohwedder, Kristie (December 2017). "Who Will Announce The 2018 Golden Globe Nominations? It's Always An A-List Affair". Bustle. Retrieved January 2, 2018. ^ "Sharon Stone & Chris Hemsworth To Present At The Golden Globes". Access Online. December 27, 2017. Retrieved January 2, 2018. ^ Falcone, Dana Rose (January 7, 2018). "I, Tonya Star Allison Janney Presents With a Bird on Her Shoulder at the Golden Globes". People. Retrieved January 10, 2018. ^ Marcus, Emily (January 5, 2018). "Golden Globes 2018: 'I, Tonya' Stars Allison Janney and Sebastian Stan to Present". US Magazine. Retrieved January 10, 2018. ^ Gonzalez, Sandra (December 28, 2017). "Amy Poehler sets return to Golden Globes as presenter". CNN. Retrieved January 2, 2018. ^ Harp, Justin (December 29, 2017). "Hugh Grant, Amy Poehler, Neil Patrick Harris and more to present at Golden Globes 2018". Digital Spy. Retrieved January 2, 2018. ^ "Britons Felicity Jones, Hugh Grant and Sting to present awards at Golden Globes". Irish Independent. January 5, 2017. Retrieved January 2, 2018. ^ Perez, Lexy (December 28, 2017). "Golden Globes: Hugh Grant, Ricky Martin, Isabelle Huppert Among First Group of Presenters". The Hollywood Reporter. Retrieved January 2, 2018. ^ "Penélope Cruz presentará los Globos de Oro junto a Ricky Martin". Europa Press (in Spanish). December 29, 2017. Retrieved January 2, 2018. ^ "Penélope Cruz y Gal Gadot, entre las presentadoras de los Globos de Oro 2018". Antena 3 Noticias (in Spanish). Madrid. December 28, 2017. Retrieved January 2, 2018. ^ Saperstein, Pat (December 11, 2017). "Female Directors Shut Out of Golden Globes Nominations". Variety. Retrieved January 2, 2018. ^ Kaufman, Amy (December 11, 2017). "Greta Gerwig on 'Lady Bird's' Golden Globe nominations, and her absence in the director category". Los Angeles Times. Retrieved January 2, 2018. ^ "Emma Watson Will Present at the Golden Globes 2018". Just Jared. December 28, 2017. ^ Pocock, Emma (December 29, 2017). "Weekly Round-Up: Emma Watson to Present at Golden Globe Awards, Julie Walters In 'Mary Poppins' Teaser Photo & More!". The Leaky Cualdron. Retrieved January 2, 2018. ^ ABC News Radio (December 28, 2017). "Gal Gadot, Seth Rogen, Chris Hemsworth & more set to present at the Golden Globe Awards". News Channel Nebraska. Retrieved January 2, 2018. ^ Davis, Brandon (December 28, 2017). "Gal Gadot And Chris Hemsworth To Present At Golden Globe Awards". Comic Book. Retrieved January 2, 2018. ^ "Alicia Vikander to help present Golden Globes". The Local. December 29, 2017. Retrieved January 2, 2018. ^ TV News Desk (December 28, 2017). "Alicia Vikander, Carol Burnett and More To Present at 1/7 Golden Globes". Broadway World. Retrieved January 2, 2018. ^ "The Golden Globe Ambassador: Presenting Hollywood's Next Generation". Retrieved January 8, 2018. ^ McNary, Dave (November 15, 2017). "Dwayne Johnson's Daughter Simone Garcia Johnson Named Golden Globe Ambassador". Variety. Retrieved January 10, 2018. ^ Alexander, Bryan (November 15, 2017). "The Rock's daughter Simone Garcia Johnson is 2018 Golden Globe ambassador". USA Today. Retrieved January 10, 2018. ^ Miller, Mike (November 15, 2017). "Dwayne 'The Rock' Johnson's Daughter Simone Named 2018 Golden Globe Ambassador". People. Retrieved January 10, 2018. ^ Sandberg, Bryan Elise (November 15, 2017). "'Miss Golden Globe' Title Retired as Dwayne Johnson's Daughter Becomes 'Globe Ambassador'". The Hollywood Reporter. Retrieved January 10, 2018. ^ Weaver, Hilary (November 16, 2017). "The Rock's Daughter Will Make History at the Golden Globes". Vanity Fair. Retrieved January 10, 2018. ^ Desta, Yohana (January 2, 2018). "Time's Up: How a Hollywood Initiative Is Tackling Sexual Predators". Vanity Fair. Retrieved January 8, 2018. ^ a b CNWN Collection. "Golden Globes 2018: How to Support the Activists' Causes". Allure. Retrieved January 11, 2018. ^ Garcia, Sandra E. (October 20, 2017). "The Woman Who Created #MeToo Long Before Hashtags" – via www.nytimes.com. ^ Yam, Kimberly. "Here's What You Should Know About The 8 Activists Who Went To The Golden Globes | HuffPost". Huffingtonpost.com. Retrieved January 11, 2018. ^ Patten, Dominic (January 8, 2018). "Golden Globe Ratings Down From 2017, Falls To 6-Year Demo Low". Deadline. Retrieved January 8, 2018. ^ Mitovich, Matt Webb (January 8, 2018). "Ratings: Golden Globes Steady vs. 2017, NFL-Fueled Fox Comedies Hit Highs". TVLine. Retrieved January 8, 2018. ^ "Golden Globes viewership down from last year". EW.com. Retrieved January 8, 2018. ^ Otterson, Joe (January 8, 2018). "TV Ratings: Golden Globes Down Slightly From 2017". Variety. Retrieved January 8, 2018. ^ Cohen, Jess (January 8, 2018). "No, the Golden Globes Didn't Forget the In Memoriam Segment...It Just Didn't Air on TV". E! News. Retrieved January 11, 2018. ^ O'Keefee, Jack (January 7, 2018). "Do The 2018 Golden Globes Have An In Memoriam Segment? The Stars We Lost Don't Go Unnoticed". Bustle. Retrieved January 11, 2018. ^ "In Memoriam". 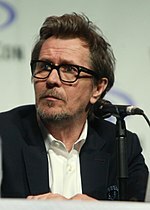 www.goldenglobes.com. Retrieved January 8, 2018. ^ Celada, Luca (August 20, 2017). "In Memoriam: Jerry Lewis, Golden Globe Nominee, 1926-2017". Golden Globe Awards. Retrieved January 11, 2018. ^ Kahana, Yoram (August 11, 2017). "In Memoriam: Glen Campbell, 1936-2017, Forever Rhinestone Cowboy". Golden Globe Awards. Retrieved January 11, 2018. ^ Babiana, Ana María (July 31, 2017). "In Memoriam: Jeanne Moreau, 1928-2017, Grande Dame of Cinema". Golden Globe Awards. Retrieved January 11, 2018. ^ Babiana, Ana María (July 16, 2017). "In Memoriam: Martin Landau, 1928-2017, Master Actor, Golden Globe Winner". Golden Globe Awards. Retrieved January 11, 2018. ^ Babiana, Ana María (July 16, 2017). "In Memoriam: John G. Avildsen, 1935-2017 - Golden Globe Nominee, Champion of the Underdogs". Golden Globe Awards. Retrieved January 11, 2018. ^ Celada, Luca (May 23, 2017). "In Memoriam: Roger Moore, Our Smiling Bond, 1927-2017". Golden Globe Awards. Retrieved January 11, 2018. ^ Babiana, Ana María (April 26, 2017). "In Memoriam: Jonathan Demme (1944-2017), Eclectic Master, Heart of Gold". Golden Globe Awards. Retrieved January 11, 2018. ^ Martin, Karen (April 29, 2017). "In Memoriam – Christine Kaufmann". Golden Globe Awards. Retrieved January 11, 2018. ^ Kahana, Yoram (February 9, 2017). "In Memoriam: Richard Hatch, Golden Globe Nominee, 1945-2017". Golden Globe Awards. Retrieved January 11, 2018. ^ Celada, Luca (January 27, 2017). "In Memoriam: John Hurt (1940-2017) The Passing of a Master". Golden Globe Awards. Retrieved January 11, 2018. ^ Kahana, Yoram (January 28, 2017). "In Memoriam: Mike Connors, aka Mannix, Golden Globe Winner, 1925-2017". Golden Globe Awards. Retrieved January 11, 2018. ^ Babiana, Ana María (January 25, 2017). "In Memoriam: Mary Tyler Moore, TV Maverick, Golden Globe Winner". Golden Globe Awards. Retrieved January 11, 2018. ^ Park, H. J. (January 20, 2017). "In Memoriam: Michèle Morgan, Legendary Star of Hollywood and France". Golden Globe Awards. Retrieved January 11, 2018. ^ Kahana, Yoran (January 16, 2017). "In Memoriam: Golden Globe Winner William Peter Blatty, Soul Searcher, Master of Horror". Golden Globe Awards. Retrieved January 11, 2018.